Pulitzer Prize–winner Starr (The Creation of the Media, 2004, etc.) is liberal and proud of it. The editor of The American Prospect offers a decidedly upbeat account of the liberal tradition. It best reflects America’s founding ideals of “life, liberty, and the pursuit of happiness,” argues Starr (Sociology and Public Affairs/Princeton Univ. 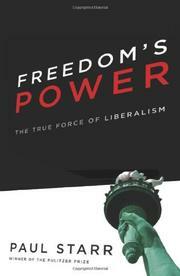 ), and has proven a workable basis for strong, enduring liberal democracies in our time. In its broadest meaning, he writes, liberalism refers to the principles of constitutional government and individual rights that emerged in the 17th- and 18th-century writings of such thinkers as Locke, Montesquieu and Madison. It animated the American and French Revolutions and led to the birth of the modern liberal state. By constraining arbitrary power and unleashing freedom’s power, constitutional liberalism sought to create a free, fair and prosperous society. Beginning in the late-19th century, democratic forces spurred the rise of modern liberalism, with its penchant for government regulation, stronger protection of civil liberties and respect for cultural diversity. While criticized from both the right and left, liberal democracies work, Starr avers. They have proven flexible, pragmatic and successful; they have weathered depressions and world wars. In the 1960s, when many deemed liberalism a failure, they fostered a great moral transformation that rectified injustices, expanded freedom and democracy and changed America for the better. Analyzing the consequences of the Bush administration’s conservative policies—growing economic inequality, environmental deterioration, long-term fiscal problems, the Iraq War—the author believes liberals now have an opportunity to build a political majority and lead the nation in a progressive direction. To do so, they must develop organizational strength, achieve intellectual coherence reflecting liberal principles and create a program based on shared prosperity. An informed and eloquent case for liberalism as the American way.